The small bookshop was stuffed with listeners from all kinds of Hong Kong folk. A great thanks to the Hanfu groups in Hong Kong, including hanfu.hk and PropLuxurians for their recommendation to host this Cantonese talk series at HK Reader, a Mong Kok bookshop specializing in sociology, anthropology, and political science topics. 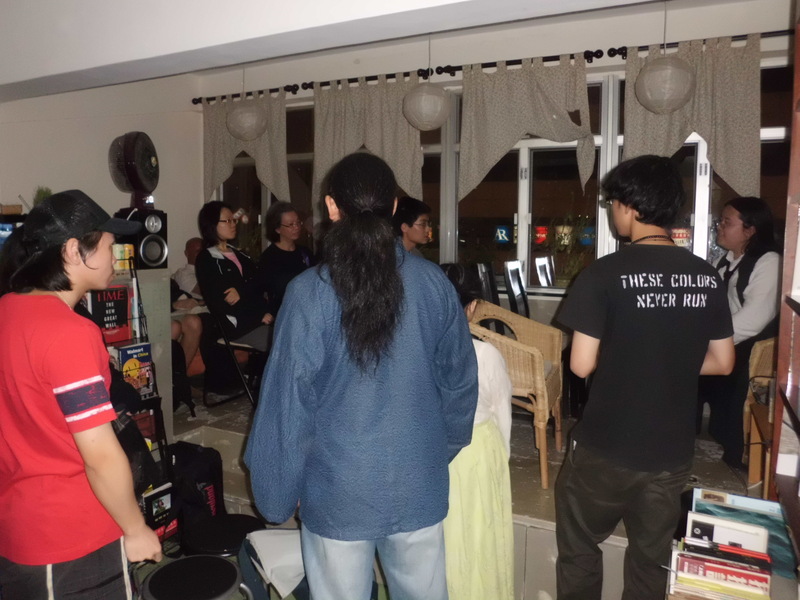 We had an excellent turnout and the small bookshop was filled up and downstage with listeners, where we shared insights and opinions from 8PM to 10PM on the causes of the hanfu movement, ethnic identity, and the importance of developing a taxonomy and vocabulary of describing things. We hope to see you all, as well as new friends, in our next lecture, to be held on November 4 (two weeks from now), at HK Reader bookshop in Mong Kok, from 8PM to 10PM (HKT)! 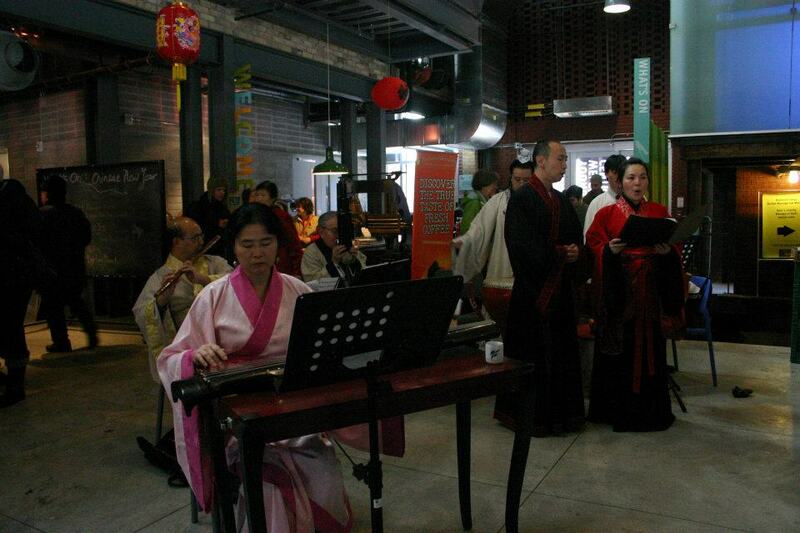 Before entering the main article, please note that there is an art exhibition and guqin demonstration by Esther Zhang, a local Chinese artist and qin player the coming Saturday, April 14, 2012 at 3PM. Please visit http://www.facebook.com/#!/events/303925063012798/ for more details. 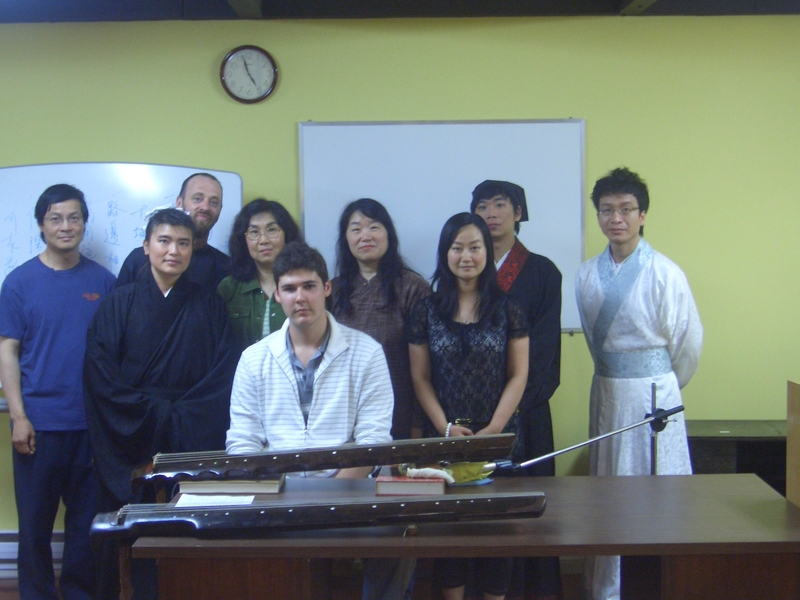 Over the years, TorGuqin has posted many event announcements on the website regarding its activities — meetings, gatherings, demonstrations, performances…and it is only intermittently that pictures or reports are posted back. Does this mean that it didn’t take place? Recently, we actually have been in more activities than described on our website (and Facebook event pages), to which thanks to Yanyan Zhu, we are now able to record our events on HD digital video in addition to our paper records of our gatherings and events. 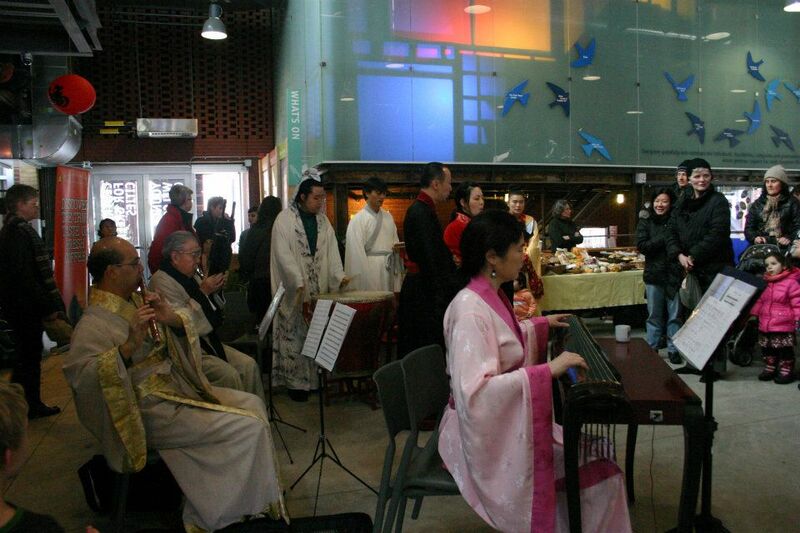 Since February 2012, TorGuqin members have performed in the Evergreen Farmer’s Market, given lectures on the qin and Chinese drama at the University of Toronto, received Dr. Keren Li from Nanjing, as well as Dr. Yip Mingmei from New York as an honoured guest to our gatherings. If a picture is worth a thousand words, then the word count of the following would be beyond millions. Kudos to Yanyan Zhu and Bill Wilson for photography. Meetings, music, and more meetings! For those wondering what TQS has been up to these days, the picture on the right gives a little hint for what is about to come — and here’s a hint, it’ll be online, and you’ll see it soon. 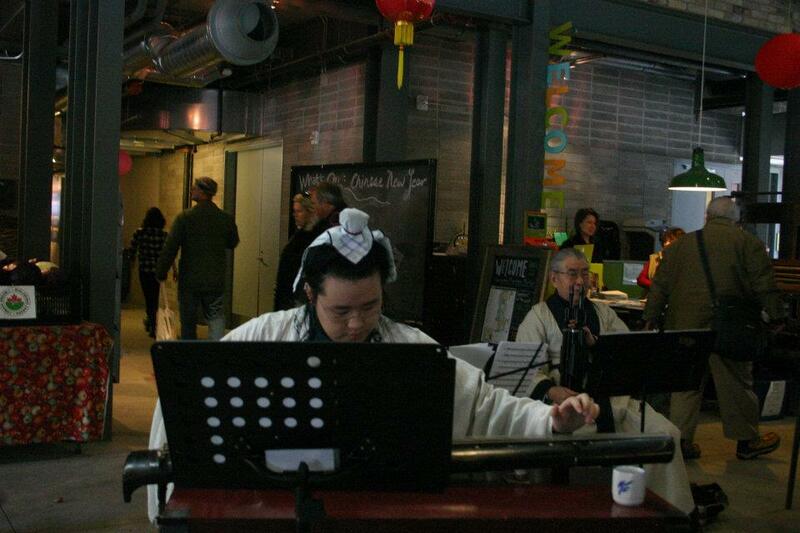 We are organizing yet another major public event, in collaboration with the Toronto Chinese Orchestra and Evergreen Brick Works! Again, stay tuned for more details. 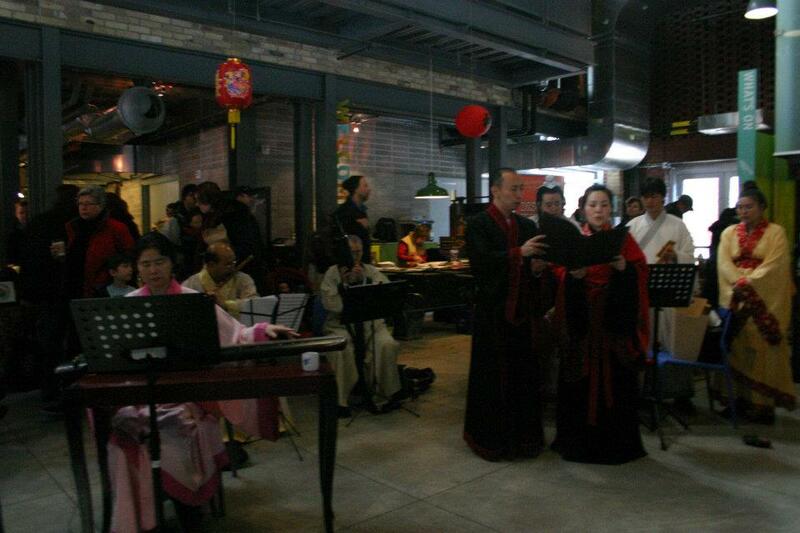 Remember, always stay tuned to TorGuqin events by subscribing to this blog (see upper right hand corner)! 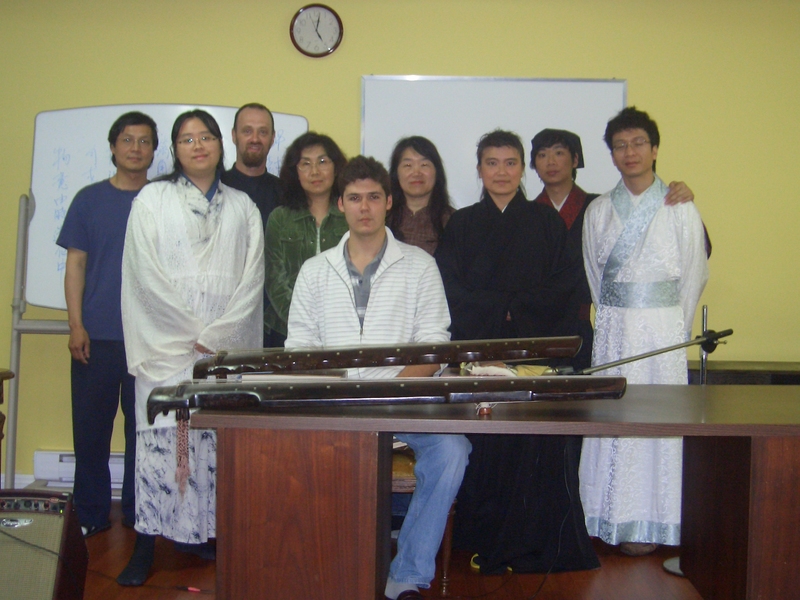 Yanyan Zhu of TorGuqin (front 2nd left) and Zhang Peiyou of NYQS (front 3rd left), along with friends and family on the day of the gathering. 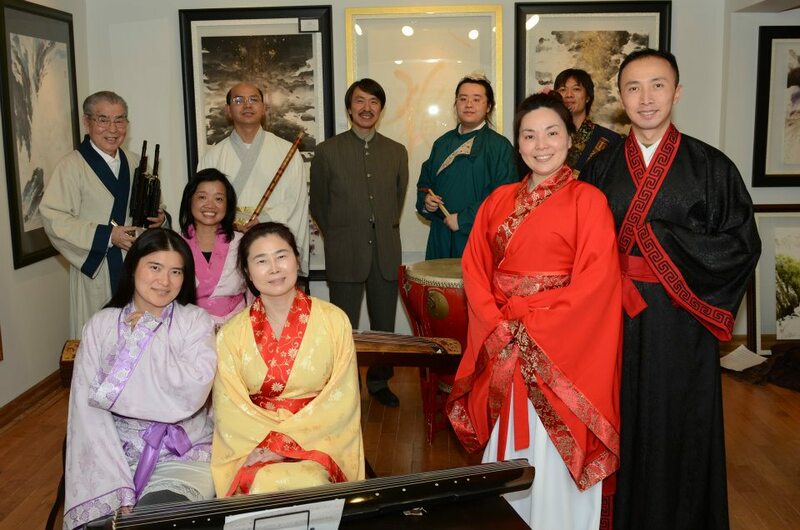 On August 7, 2011, Yanyan Zhu (of Longyin Qin Studio and TorGuqin) and her family were warmly received by members of the New York Qin Society (NYQS) in a local gathering, where we shared music, singing, food, and calligraphy. Despite some fretting the night before, we managed to take lots of memories in the form of pictures, audio recordings, and videos! Great thanks to Matthew Flannery for bringing the various calligraphy scrolls and works of Zeng Xi 曾熙 (1861-1930), calligraphy master and teacher of modern Chinese painting maestro Zhang Daqian 張大千, and Jeanette for the delectable refreshments for everyone to enjoy. For Chang Peiyou’s account of the day and evening, see her accounts here. If you have Facebook, see a video of Yanna playing Jiu Kuang here. Also click below for more audio recordings. Kudos to Chang Peiyou for the source. NYQS Judy Yeh and student Sam Zhang playing Guanshan Yue. More pictures on NYQS site and Facebook group. See more about the event, or catch up with the New York group on Facebook, located here. Thanks for coming by TorGuqin @ SPoT Summer 2011! A big thank you to everyone who came by on Sunday, Jun 21 by our Small Press of Toronto Book Fair booth! Also, a very nice to meet you to all of our new friends who learned about our society on that day, and we hope to see you again soon in a gathering! In other news, I sadly announce that the TorGuqin members’ CDs currently on sale at Lulu.com will be discontinued from sales after September 19, 2011 as the said printer will no longer provide CD/DVD printing services. We are looking into alternative POD CD publishers, and will keep you advised on the issue. At the meantime, we highly recommend you to show your support to our talent by buying our books and CDs — revenues go the individual artists themselves, and is an excellent way of showing support for developing the Toronto qin community! Head over to the discography page or click the links below to buy them today! Long Yin -dragon murmurs- by Yanyan Zhu. 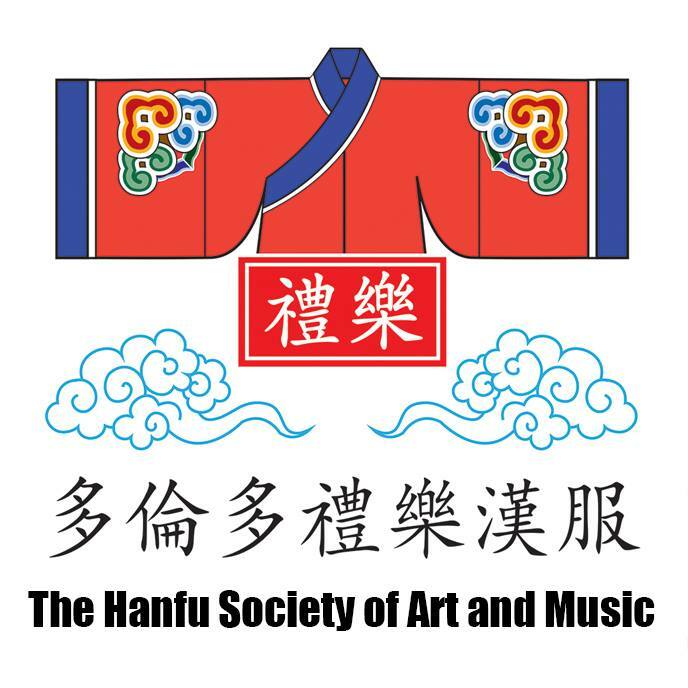 Toronto Guqin Society is graciously invited by William Ho of The ONE Gallery to organize our summer (June) gathering in the scenic historical Unionville Main Street! 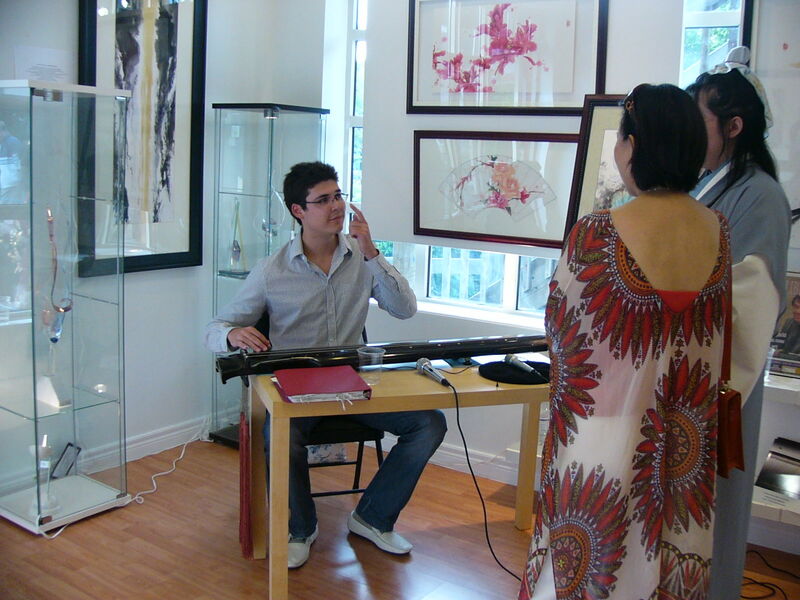 Join us for an afternoon of a relaxed atmosphere, tea, enjoying guqin music, and examine Chinese paintings and glass sculptures by the gallery owner! 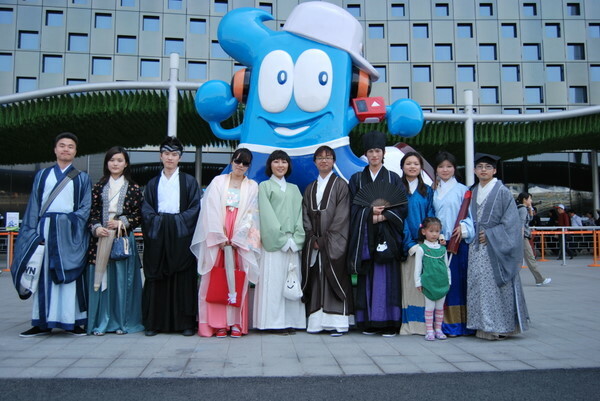 Members of the Chong Zheng Delegation from Hangzhou pose in Hanfu at the Shanghai Expo 2010. What comes to your mind when a person wearing Chinese traditional clothing walk next to you on the street? What are the significances of Chinese traditional clothing in our contemporary world? 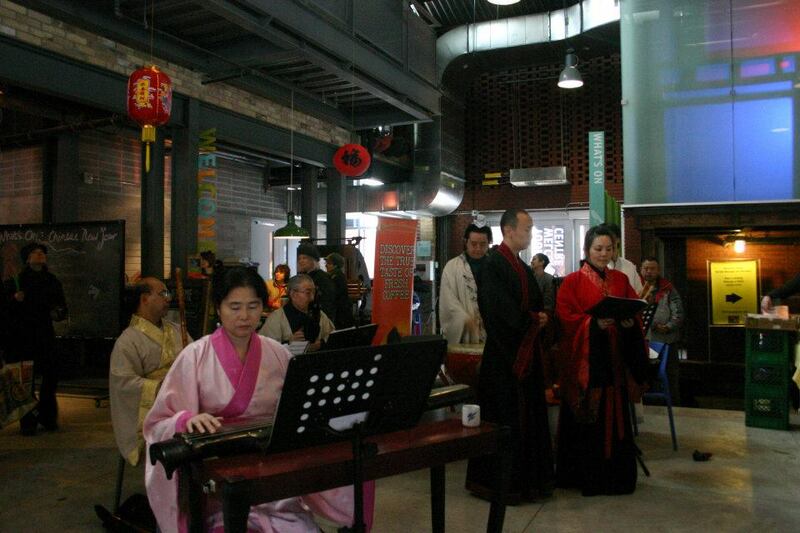 Would you like to try on some Chinese traditional clothing while inquiring into the meanings behind? 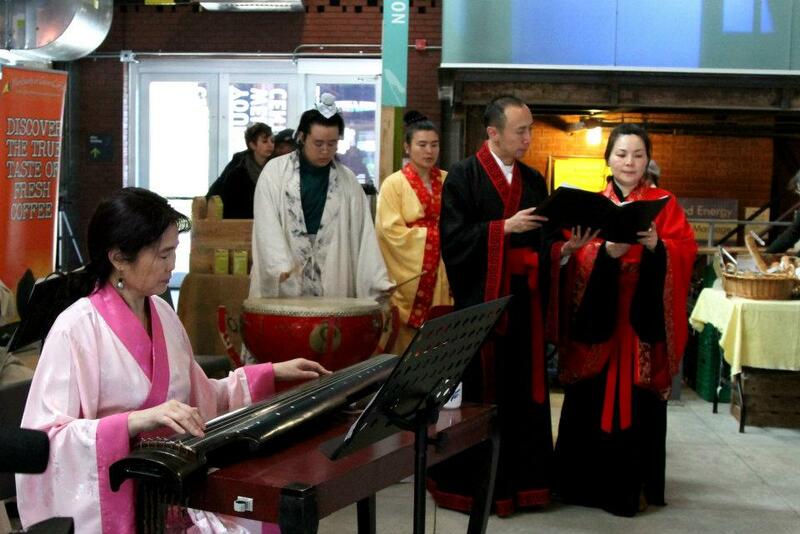 In this lunch and learn session, our guest speaker Juni Yeung from the Toronto Guqin Society https://torguqin.wordpress.com will share her insights about the recent Hanfu (Han clothing) phenomenon in China, where young people challenge the “Chinese fashion image” as the “Qipao” and “Tangzhuang” commonly found in cheap Chinatown stores around the globe. but re-imported into China as an icon for “tradition.” Why does “ancient” clothing look so different from the Chinese wear today? Why is there such a heavy reluctance about making, selling and wearing them? This session will give a firsthand experience to explore the clothes and the critical reason that few Chinese mention today. 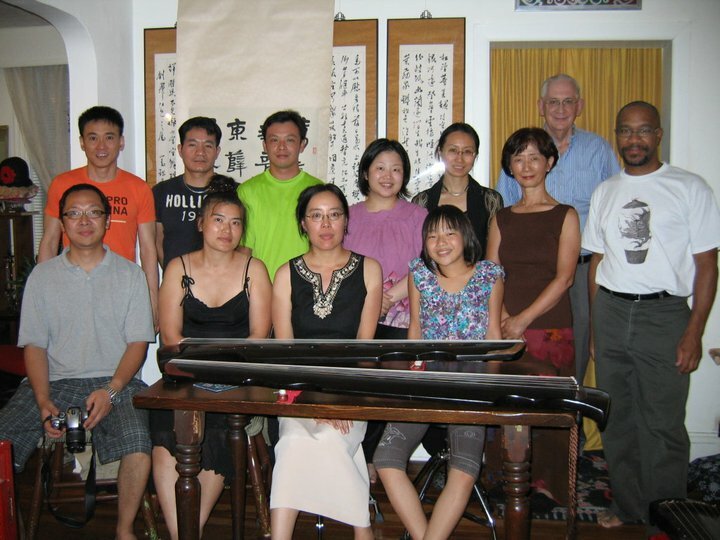 Brought to you by the Toronto Guqin Society, Chinese Canadian National Council Toronto Chapter, Centre for Social Innovation, and MelonAge Inc.
TorGuqin Cham Shan Temple Gathering, June 20, 2009. On the rainy afternoon of Saturday, June 20, 2009, 10 members from TorGuqin gathered outside the main temple hall of Cham Shan Temple for a scheduled homage tour of the various deities and the projects held by the temple to spread Buddhism in Eastern Canada by establishing branches of major temples in China here. Because of the nature of the sacred site, no pictures were taken. This tour began at 2:15 PM and proceeded until about 3:00 PM. Juni Yeung, Songxia Guantao in Yanlulou Qinpu (1766), on silk strings. Alex Tsang, Qiusai Yin (also titled Saoshou Wentian or Shuixian Cao). 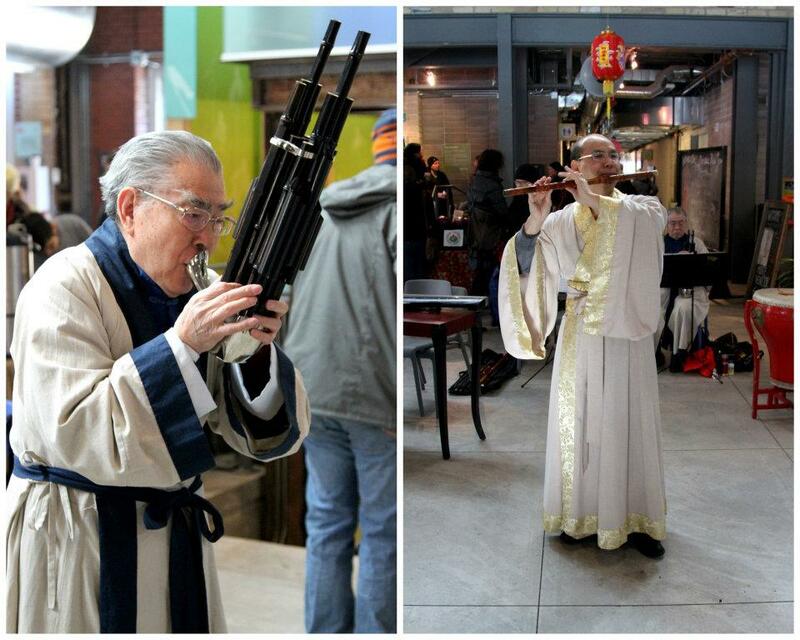 As performed in the style of Wu Shaoji. 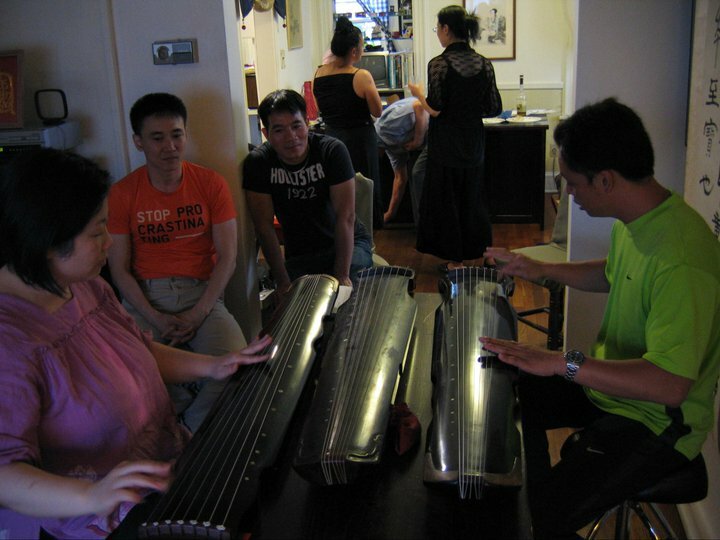 Yat-shing Chow, Yangguan Sandie as recorded in Guqin Quji. Yanyan Zhu, Pu’an Zhou in unique style, based on the Mei’an score. The gathering ended at 5:30 PM, where some members joined for a dinner at Asian Legends Restaurant (Wei-xiang Chuan) afterwards. Also a group photo. See who's different? Listening. 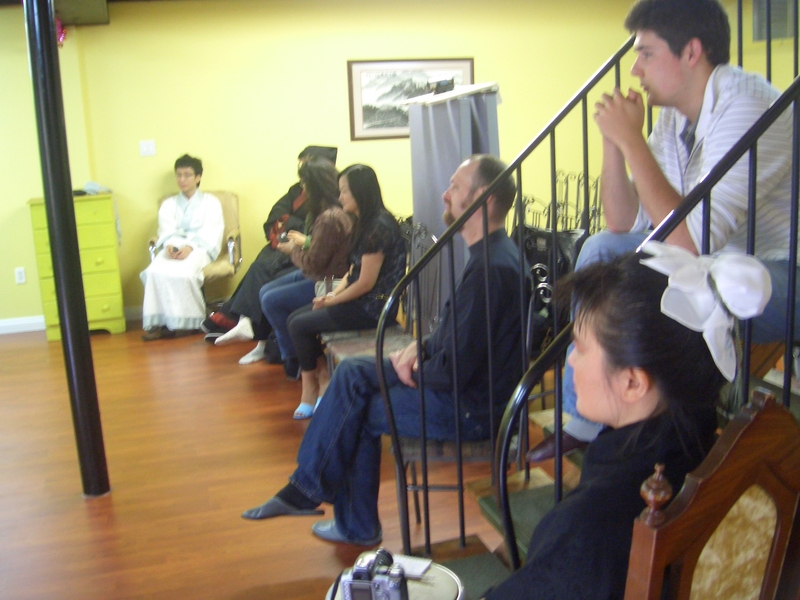 Note that half of the attendees were in Hanfu. Despite the heavy winds and the THREE snowstorm warnings, 10 of us were able to converge and celebrate the going of a year and from here on, our daylight hours begin to increase again! Thank you to all who have attended our gathering today, it was a great turnout of over 10 people! (Some people had to leave early and weren’t in this group photo, but don’t worry – we’ve got you other pictures!) Let’s review some of the happenings today.